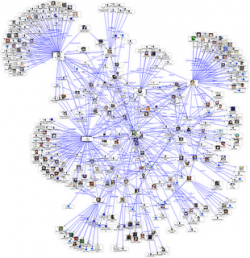 HomeBlogMining Your Social Networks for Content Marketing Ideas. Creating compelling content that engages your readers isn’t as simple as pressing a button or running an automated link building tool (of course, the things that are effective usually require more effort to complete!). You’ve got to actually work to uncover the ideas that your audience will respond best to and to put these ideas into practice in engaging content pieces. Fortunately, there’s one thing you can do to minimize the amount of time you need to spend on the first part of the process. By mining your social networks for content marketing ideas, you can seriously cut back on your total research time and increase the odds that your ideas will ultimately be successful with your audience. Ideally, when creating content marketing pieces, your goal is to create materials that your followers will share with each other. This type of viral-style sharing increases the reach of your brand without requiring your direct involvement  giving you more bang for your marketing buck. So if you want to build the types of content that your social followers are most likely to share, the easiest place to start is to see what they’re already sharing! To use this strategy, log in to your business’s Twitter account and navigate to the feed that displays the activity of the people who are currently following you. Scroll down the list and open the links of any blog articles or infographics that your followers have shared directly or retweeted. Once you’ve opened up a handful of windows, make a note of the subject matter and type of content found at each link. Pay special attention to any trends that can be gleaned from this information. For example, if you see several articles on a single topic or find that your audience prefers sharing videos to text-based articles, use this information when it comes time to create your own content marketing campaign pieces. Another way to use your social network’s activity to inform your content creation process is to pay attention to the posts from your industry’s authority figures that are gaining the most traction. To do this, you’ll need to start  obviously  by identifying your industry’s authority figures. Ideally, this won’t be the first time you do this, as forming relationships with these people can be a valuable way to grow and promote your website beyond simple data mining. Once you’ve found these people, take a look at their social media profiles, paying special attention to the relative amount of engagement each of their updates has received. For example, if you see that one tweet in particular from an industry authority figure has more replies, retweets and favorites than any other, it could be that the update struck a chord with his or her readers. Carry out this same process on all of the major social networks, as the strength of an influencer’s following may vary by platform. Whether you find this information on Facebook, Twitter, Google+ or Pinterest, the key is to look out for posts that stand out in terms of engagement. Identifying a few of these popular updates can give you insight into the topics that appeal most to your audience  paving the way for the creation of your own content pieces targeting these same ideas. But while the idea of monitoring influencers’ activity has the potential to turn up some interesting content creation ideas, keep in mind that this strategy has one major weakness  it’s not tailored to your particular audience! Sure, the odds are good that readers who were interested in a content piece on one particular topic will wind up engaged with future posts on this same subject. But at the same time, posting repeatedly about the same topic can lead to audience burnout and risks making you look like a copycat who’s ripping off better-known professionals. So what’s a content marketer to do? Well  for starters  why not ask your audience directly what they want to read about? Sending direct messages to your most devoted social media followers asking if they have any future post requests. Creating polls featuring possible topic ideas and posting them to your social profiles. Offering an incentive or creating a giveaway contest for the social follower who gives you the best new blog post idea. Directing social media followers to a SurveyMonkey survey that asks them about their current needs and interests. First of all, while this strategy can be effective, it should be used in moderation. Asking your followers what they’d like you to cover on your website once a week runs the risk of making you look uneducated and uninformed about your audience. Really, if you can’t handle coming up with your own blog post topics on a regular basis, why should these readers trust the information you give out on your site? In addition, it’s important to keep in mind that what people say they want and what they actually want are often two different things. It’s entirely possible that you’ll wind up soliciting ideas on your favorite social network, getting excited about a possible topic that arises and then find yourself facing crickets chirping when the actual piece goes live. For these reasons, it’s a good idea to use this strategy sparingly  no more than once per month. In the meantime, if you’re stumped for content marketing ideas, use the other strategies described above or more time-tested approaches (like researching industry trends or mining your website’s analytics account for information on your past top content pieces). Your social media accounts can be great sources of information on the types of content and the topics that are performing best with your audience members. Use this market research data to your advantage by making it a regular priority to engage with these followers and explore the content pieces they’re sharing  your own content marketing efforts will thank you!